﻿ Fun Easy English - Environment - Global warming - The scientific overview of climate change. Earth's climate is changing. Multiple lines of evidence show changes in our weather, oceans, ecosystems, and more. Natural causes alone cannot explain all of these changes. Human activities are contributing to climate change, primarily by releasing billions of tons of carbon dioxide (CO2) and other heat-trapping gases, known as greenhouse gases, into the atmosphere every year. Climate changes will continue into the future. The more greenhouse gases we emit, the larger future climate changes will be. Changes in the climate system affect our health, environment, and economy. We can prepare for some of the impacts of climate change to reduce their effects on our well-being. Picture - These maps show temperatures across the world in the 1880s (left) and the 1980s (right). Blue colors represent cooler temperatures compared with the average temperatures from 1951 to 1980, and red colors represent warmer temperatures compared to this average. The map on the left shows that it was colder in the 1880s in most places. The map on the right shows it was warmer in the 1980s in most places. Earth's average surface temperature has increased by more than 1.5°F since the 1880s. Two-thirds of the warming has occurred since 1975, at a rate of roughly 0.3°F – 0.4°F per decade. Natural processes such as changes in the sun's energy, shifts in ocean currents, and others affect Earth's climate. However, they do not explain the warming that we have observed over the last half-century. 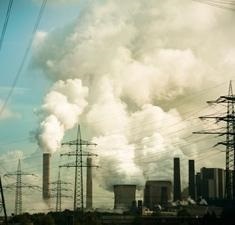 Most of the warming of the past half century has been caused by human emissions of greenhouse gases. Picture - Models that account only for the effects of natural processes are not able to explain the warming observed over the past century. 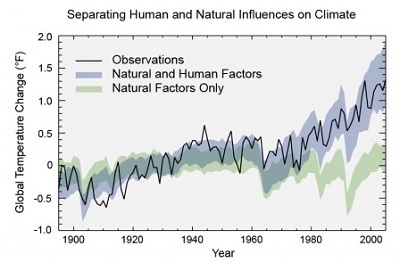 Models that also account for the greenhouse gases emitted by humans are able to explain this warming. Greenhouse gases come from a variety of human activities, including: burning fossil fuels for heat and energy, clearing forests, fertilizing crops, storing waste in landfills, raising livestock, and producing some kinds of industrial products. Greenhouse gas emissions are not the only way that people can change the climate. Activities such as agriculture or road construction can change the reflectivity of Earth's surface, leading to local warming or cooling. This effect is observed in urban centers, which are often warmer than surrounding, less populated areas. Emissions of small particles, known as aerosols, into the air can also lead to reflection or absorption of the sun's energy. The extent of the change will depend on how much, and how quickly, we can reduce greenhouse gas emissions. 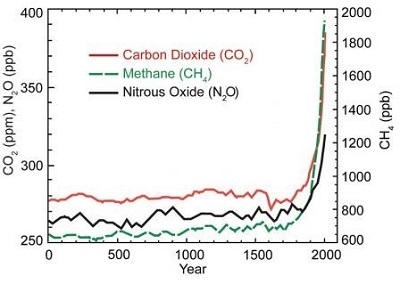 Picture - This graph shows the increase in greenhouse gas (GHG) concentrations in the atmosphere over the last 2,000 years. Increases in concentrations of these gases since 1750 are due to human activities in the industrial era. Concentration units are parts per million (ppm) or parts per billion (ppb), indicating the number of molecules of the greenhouse gas per million or billion molecules of air. 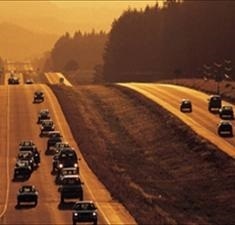 During the 21st century, global warming is projected to continue and climate changes are likely to intensify. Scientists have used climate models to project different aspects of future climate, including temperature, precipitation, snow and ice, ocean level, and ocean acidity. Depending on future emissions of greenhouse gases and how the climate responds, average global temperatures are projected to increase worldwide by 0.5°F to 8.6°F by 2100, with a likely increase of at least 2.0°F for all scenarios except the one representing the most aggressive mitigation of greenhouse gas emissions. Warmer temperatures increase the frequency, intensity, and duration of heat waves, which can pose health risks, particularly for young children and the elderly. Climate change can also impact human health by worsening air and water quality, increasing the spread of certain diseases, and altering the frequency or intensity of extreme weather events. Rising sea levels threaten coastal communities and ecosystems. Changes in the patterns and amount of rainfall, as well as changes in the timing and amount of stream flow, can affect water supplies and water quality and the production of hydroelectricity. Changing ecosystems influence geographic ranges of many plant and animal species and the timing of their lifecycle events, such as migration and reproduction. Increases in the frequency and intensity of extreme weather events, such as heat waves, droughts, and floods, can increase losses to property, cause costly disruptions to society, and reduce the availability and affordability of insurance. 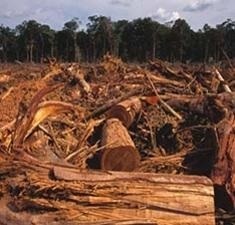 We can prepare for some of the likely climate change impacts to reduce their effect on ecosystems and human well-being. Making such preparations is known as adaptation. Examples of adaptation include strengthening water conservation programs, upgrading storm water systems, developing early warning systems for extreme heat events, and preparing for stronger storms through better emergency preparation and response strategies.